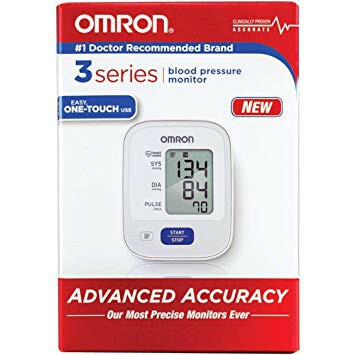 The Omron 3 Series Upper Arm Blood Pressure Monitor with Cuff is an easy-to-use at Home Blood Pressure Monitoring Device which features Omron's Advanced Accuracy Technology. If you have been diagnosed with hypertension, are currently taking blood pressure medications, have coexisting conditions such as kidney disease or Type 2 Diabetes or have had borderline high blood pressure readings at your doctor's office. An at-home BP monitor is an effective and preventative method in getting your blood pressure under control. If left unchecked you could be at high risk for a heart attack, brain aneurysm, or stroke. With the Omron BP710N 3 Series Upper Arm Blood Pressure Monitor you can comfortably, and quickly get a blood pressure reading. This Home Diagnostic Device features a simple one-touch mode which allows you to effortlessly obtain a reading with just a press of a button. The Advanced Accuracy feature makes sure that you receive an accurate reading every time ensuring consistent and precise monitoring of your blood pressure. It also comes complete with a wide range D-Ring cuff that fits arms 9 inches to 17 inches in circumference. This BP monitor can detect an irregular heartbeat while you measure your blood pressure so that you can consult with your physician about treatment. 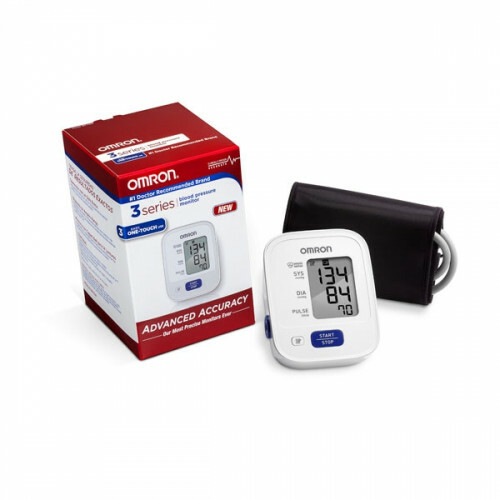 The Omron 3 series BP Monitor can also store up to 14 readings at a time which you can review with just a simple touch of a button and includes the monitoring unit, one wide-range cuff, an instruction manual, and a quick start guide.